As an investor, should you put all of your money in one stock or should you spread your bets across many investments? If it is the latter, how many investments should you have in your portfolio? The debate is an old one and there are many views but they fall between two extremes. At one end is the advice that you get from a believer in efficient markets: be maximally diversfied, across asset classes, and within each asset class, across as many assets you can hold: the proverbial “market portfolio” includes every traded asset in the market, held in proportion to its market value. At the other is the “go all in” investor, who believes that if you find a significantly undervalued company, you should put all or most of your money in that company, rather than dilute your upside potential by spreading your bets. These arguments got media attention recently, largely because two high-profile investors took opposite positions. The first salvo was fired by Mark Cuban, who made his substantial fortune (estimated by Forbes to be $2.5 billion in 2011) as an entrepreneur who founded and sold Broadcast.com for $ 6 billion by Yahoo!, at the peak of the dot com boom. Cuban's profile has increased since, largely from his ownership of the Dallas Mavericks, last year's winners of the NBA championship, and his intemperate outbursts, about referees, players and the NBA in general. With typical understatement, Cuban claimed that diversification is for idiots and that investors, unless they have access to information or deals, should hold cash, since hedge funds have such a tremendous advantage over them. In response, John Bogle, the father of the index fund business, countered that "the math (for diversification) has been proved over and over again. It's not just the first thing an investor should think about, but the second, the third and probably the fourth and the fifth thing investors should think about". So, should you diversify? And if so, how much should you diversify? The answers to these questions depend upon two factors: (a) how certain you feel about your assessment of value for individual assets (or markets) and (b) how certain you are about the market price adjusting to that value within your specified time horizon. o Finite life securities (Options, Futures and Bonds): If you find an option trading for less than its exercise value: you should invest all of your money in buying as many options as you can and exercise those options to make a sure profit. In general, this is what falls under the umbrella of pure arbitrage and it is feasible only with finite lived assets (such as options, futures and fixed incomes securities), where the maturity date provides a endpoint by which time the price adjustment has to occur. o A perfect tip: On a more cynical note, you can make guaranteed profits if you are the receipient of inside information about an upcoming news releases (earnings, acquisition), but only if there is no doubt about the price impact of the release (at least in terms of direction) and the timing of the news release. (Rumors don’t provide perfect information and most inside information has an element of uncertainty associated with it.) The problem, of course, is that you would be guilty of insider trading and may end up in jail... .
· At the other limit, if you have no idea what assets are cheap and which ones are expensive (which is the efficient market proposition), you should be as diversified as you can get, given transactions costs. If you have no transactions costs, you should own a little piece of everything. After all, you gain nothing by holding back on diversification and your portfolio will be deliver less return per unit of risk taken. Most active investors tend to fall between these two extremes. If you invest in equities, at least, it is inevitable that you have to diversify, for two reasons. The first is that you can never value an equity investment with certainty; the expected cash flows are estimates and risk adjustment is not always precise. The second is that even if your valuation is precise, there is no explicit date by which market prices have to adjust; there is no equivalent to a maturity date or an option expiration date for equities. A stock that is under or over priced can stay under or over priced for a long time, and even get more under or over priced. There is one final point worth making. Note that how much you diversify will be based upon your perceptions of the quality of your valuations and the speed of market adjustment, but perceptions are not reality. In fact, psychologists have long noted (and behavioral economists have picked up the same theme) that human beings tend to have too much confidence in their own abilities and too little in the collective wisdom of the rest of the world. In other words, we tend to think our valuations are more precise than they really are and that the market adjustment will occur sooner than it really will. a. Uncertatinty about investment value: If your investment strategy requires you to buy mature companies that trade at low price earnings ratios, you may need to hold fewer stocks , than if it requires you to buy young, growth companies (where you are more uncertain about value). In fact, you can tie the margin of safety (referenced earlier in this chapter to how much you need to diversify; if you incorporate a higher margin of safety into your investing, you should feel more comfortable holding a less diversfied portfolio. As a general propostion, your response to more uncertainty should be more diversification, not less. b. Market catalysts: To make money, the market price has to adjust towards your estimated value. If you can provide a catalyst for the market adjustment (nudging or forcing the price towards value), you can hold fewer investments and be less diversifed than a completely passive investor who has no choice but to wait for the market adjustment to happen. Thus, you will need to hold fewer stocks as an activist investor than as an investor who picks stocks based upon a PE screen. Ironically, this would mean that the more inefficient you believe markets are, the more diversified you will need to be to allow for the unpredictability of market movements. c. Time horizon: To the extent that the price adjustment has to happen over your time horizon, having a longer time horizon should allow you to have a less diversified portfolio. As your liquidity needs rise, thus shortening your time horizon, you will have to become more diversifed in your holdings. In summary, then, there is nothing irrational about holding just a few stocks in your portfolio, if they are mature companies and you have built in a healthy margin of safety, and/or you have the power to move markets. By the same token, it makes complete sense for other investors to spread their bets widely, if they are investing in young, growth companies, and are unclear about how and when the market price will adjust to value. So, the choice is not between diversification and active investing, since you can pick stocks and be diversified at the same time. It should be centering on making the right decision on how much diversification works for you,. Investors are thinly diversified: The typical investor is not well diversified across either asset classes, or within each asset classes, across assets. A study of 60,000 individual investor portfolios found that the median investor in this group (which was a representative sample of the typical active investor in the United States) held three stocks and that roughly 28% of all investors have portfolios composed of one stock. In a later study, the same authors find that not only do investors hold relatively few stocks but that these stocks tend to be highly correlated with each other (same sector or type of stock). Many are thinly diversified for the wrong reasons: While the lack of diversfication can be justified if you have good information or superior assessments of value, many of the undiversfied investors in this study failed to diversfy for the wrong reasons. On average, not only did younger, poorer less eductated investors diversify less, but they, as a group, tend to be over confident in their abilities to pick stocks. And they pay a price for being thinly diversified: Not surprisingly, investors who fail to diversify because they are over confident or unfamiliar with their choices pay a price. On average, they earn about 2.40% less a year, on a risk adjusted basis, than their more diversified counterparts. But some undiversified investors are good stock pickers: On a hopeful note, there are clearly some active investors who hold back on diversification for the right reasons, i.e., because they have better assessments of value for stocks than the rest of the market and long time horizons. A study of 78,000 household portfolios finds that the among households wealthy enough to be diversified, those with more concentrated portfolios (holding one or two stocks) earn higher returns than those with more diversified portfolios (holding three or more stocks) by about, though they are also more volatile. The study goes on to note that the higher returns can be attributed to stock picking prowess and not to market timing or inside information. Most investors are better off diversifying as much as they can, investing in mutual funds and exchange traded funds, rather than individual stocks. Many investors who choose not to diversify do so for the wrong reasons (ignorance, over confidence, inertia) and end up paying dearly for that mistake. Some investors with superior value assesssment skils, disciplined investment practices and long time horizons can generate superior profits from holding smaller, relatively undiversified portfolios. Even if you believe that you are in that elite group, be careful to not fall prey to hubris, where you become over confident in your stock picking and market assessments and cut back on diversification too much. 1. Is it possible that you are wrong in your assumptions and that other investors are far more optimistic about revenue growth/ operating margins? There is no room for hubris in markets. Investors who do not admit to their mistakes, fix them and move on are doomed to pay a steep price. So, I will start with the presumption that I am wrong and the market is right and assess the likelihood, using two techniques. Simulations: In the last few years, I have used an add-on to Excel called Crystal Ball to run simulations. In a simulation, you input distributions for key inputs where you feel uncertain about the future. In the Groupon valuation, I made revenue growth and operating margin into distributions – compounded 5-year revenue growth is uniformly distributed between 30% (pessimistic end) and 70% (optimistic limit) and the target operating margin is assumed to be normally distributed, with an average of 23% and a standard deviation of 4%. I then ran 10,000 simulations, drawing from the distributions, and presents a distribution of values, shown below. 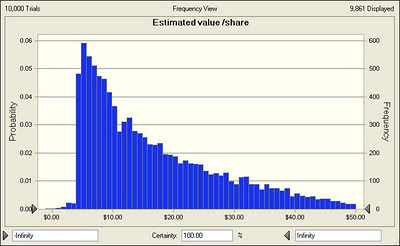 Note that there is only a 15% chance that the value is greater than $28 (1500 outcomes out of the 10000 yielded values of $28 or higher). In fact, while the average value is around $14, there are far more outcomes under $10 than above... Put differently, you are not going to win on this stock most of the time, but if you do, you have to hope it is a big win. 2. Is it a problem with the approach? Does DCF systematically undervalue young, growth companies? As many of you know, I am a staunch defender of discounted cash flow valuation, but here are a couple of criticisms I have heard of the model (especially in the context of valuing young, growth companies like Groupon) that I want to address. a. DCF valuation is inherently conservative. It will under value growth companies. An analyst that I was chatting with in the last day was dismissive when I gave him the result of my Groupon valuation, and his claim was that “DCF valuations always understate the value of young, growth companies”. But is that true? Those of you who have been reading my blog and know that I valued Facebook, Skype and Linkedin earlier this summer (and found them all over valued) may very well conclude that I would find all social media companies to be over valued right now. That may be true, but it cannot be generalized to DCF as a technique. There is a bias that comes from the timing of these valuations: I chose these companies to value because they were in the news and were either going public or thinking about it. But when do companies in a sector think about going public or offering themselves for sale? It is when managers believe they will receive a favorable valuation. Put differently, I am valuing social media companies at a time when the market is most likely to be over valuing them. To provide some perspective, I valued dozens of dot com companies in the 1998, 1999 and 2000 and I found every one of them to be over valued. In 2001 and 2002, when I revisited the sector (or what was left of it), I found many of the same companies to be under valued. 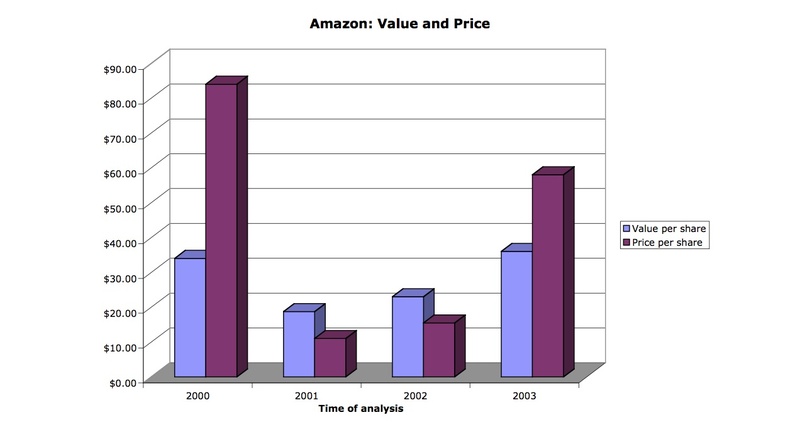 In the graph below, for instance, I have my value and the market price for Amazon.com each year from 2000 to 2003; notice how over valued it was in early 2000 and how under valued it looks in 2001. The bottom line: DCF is not inherently conservative, but done right, it is contrarian. You are likely to find stocks to be under valued when the market mood for a sector is darkest and stocks over valued when investors are enamored about a sector. There is some truth in this statement and I did cover one aspect when I talked about the “option” premium in some growth companies in my earlier post on the value of growth. What am I talking about? If I had valued Apple as a personal computer company in 2000, I would have missed its expansion into the entertainment business in the last decade. Similarly, if I had priced Google as a search engine in 2004, I would not have considered its expansion into other businesses in the last few years. If Groupon is successful in its core business, could it expand into other businesses? Sure, but there are two levels at which I would be skeptical in this case. First, I am not sure what Groupon competitive edge will be in these unspecified new businesses. Second, even when I have estimated a real option premium, I have never obtained an increase of more than 20-25% on my DCF value. 3. If you believe that the value is only $14 or $15 a share (or lower), how do you explain the $28/share price? My first response is that I feel no urge to explain the $28/share price, since I did not pay it. My second is that this is a snarky response and that I should be able to put myself in the shoes of those who did buy the stock today and explain why. I could take the generous view and attribute their actions to more optimistic assumptions about growth/profitability (and a higher value). I think that there is a simpler, more likely explanation. I would wager than most of the investors buying Groupon stock today have absolutely no idea what its value is and could not care less. They are playing a very different game than I am. With a time horizon measured in minutes, hours and days, they are buying the stock today, hoping to flip it to someone else at a higher price next week. Will some of them make money? Sure, and I don't begrudge them their profits. It is just a game I am good at and I won't even try! 4. If you believe that the intrinsic value is only $10-$15, should you short the stock? In the Google shared spreadsheet that I put up in my last post, I notice that many of you, who found the stock to be over valued, plan to sell short the stock. You are far braver than I am! I did not sell short on any of the dot com companies that I found over valued in 1999 and early 2000. In hindsight, could I have made money by doing so? Eventually, yes, but eventually would have been a long time coming on some of those stocks... My problem with selling short has always been that I don’t control my time horizon; the person who has lent me the shares does. After all, even if you are right in your assessments of value, you will not make money until the market corrects its “mistakes” and that may take weeks, months or even years. With hot sectors, where prices are based on perceptions and the herd is “optimistic”, I think it is far more prudent to get out of the way and let the momentum investors have their day in the sun. My day will come!!!! Are you ready to value Groupon? After a series of missteps, it looks like the Groupon valuation is ready to hit the market on Friday, with the final pricing to be done on Thursday. To bring you up to date on this unfolding story, the initial talk during the summer was that the company would be valued at $20 billion or more. In the months afterwards, loose talk from management of how customer acquisition costs were not operating expenses and what should be recorded as revenues got in the way of the sales pitch. As management credibility crumbled, the value dropped by the week and it looks like the company will now go public at an estimated value of about $12 billion, though only 5% of the shares will be offered in the initial offering. As with the Linkedin and Skype valuations that I did earlier this year, I thought it would be useful to do a valuation of Groupon. Before I put my numbers down, though, let me emphasize that I don't have an inside track on this valuation and that these are just my estimates. Rather than contest them, I would suggest that you go into the spreadsheet that I have attached with the valuation and make your own estimates. Before I do the valuation, though, a little on Groupon’s business model. Groupon works with any business (retail, restaurant, service) allowing it to sell products/services at a discount (usually 50% or higher). Thus, a restaurant that normally would charge $50 for a meal can offer a 50% discount to Groupon customers who would buy it at $25; Groupon and the business then split the $25. With a 50/50 split, Groupon's revenues would then be $12.50. (One of the controversies over the last few month was whether Groupon could claim revenues of $25 (the discounted price of the service) or $12.50 (its share)). To get the current numbers, I started with the S1 that Groupon filed with the SEC in October 2011. This filing has the numbers from 2010 and for the first nine months of 2011 (as well as the first nine months of 2010), which can be used to extract the trailing 12-month numbers for the company. Rationale: This was a tough one! Groupon’s revenues increased from $312 million in 2010 to $1,290 million in 2011, an increase of more than 300%. That is going to be impossible to sustain but to make a judgment on growth rates for the future, I had to estimate the potential market. The potential market is large since it encompasses “long term excess capacity” at almost any consumer-oriented businesses. It is worth noting that this excess capacity is high right now, because of the poor state of the economy, but even allowing for halving in excess capacity across the board, there is plenty of room to grow. My estimate: 50% compounded revenue growth for next 5 years, declining to a stable growth rate of about 2% in year 10. Groupon’s total revenues in year 10 will be about $25 billion. Rationale: Groupon is losing money right now and it is doing so because its marketing and customer acquisition costs are huge. That, by itself, is to be expected, given their focus on increasing the number of subscribers. To estimate what their margins will be, if they succeed with their business model, we have to estimate what these two expenses will look like for a mature Groupon. I tried to estimate these numbers, using the very limited information that is in the financial statements for the last two years. Since I am assuming high growth in revenues, I thought it prudent that the firm reinvest to generate this growth. I have estimated a dollar in capital invested in the business will generate $2 in incremental revenues. Since the average subscriber in Groupon generates only $11.6 in revenues for the company, continued high growth will require substantial costs in acquiring new customers and holding on to existing ones. My estimate: The pre-tax operating margin will improve gradually over time to 23% in year 10, with operating margins staying negative through year 6. A legitimate argument against high margins is that this is a business where the competition is active and aggressive, both from established players like LivingSocial and Amazon but from new players. If you buy into this argument, you will use lower, more conservative margins. Rationale: Groupon is a small, high growth, high risk business right now. If my revenue growth and margin estimates come to fruition, though, it will become a larger, more profitable and more stable entity over the next 10 years. As that happens, its cost of capital should change. My estimate: In the initial period, I assumed that Groupon would continue to be all-equity funded and have a cost of equity of firms in the top decile in terms of risk. (With a beta of 2, a riskfree rate of about 2% and an equity risk premium of 6.5%, this works out to a cost of capital of 15%). 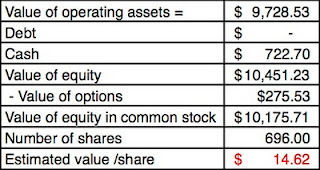 In its mature state, I dropped this cost of capital to the market-wide average in November 2011 of about 8%. Rationale: At some point in time, Groupon’s growth days will be behind it and it will be a mature company, growing at roughly the same rate as the economy. When that happens, its risk profile and cost structure will resemble that of a mature company. I am also assuming, rather optimistically, that there is a 0% chance that the firm will collapse over the next 10 years. My estimate: Groupon will become a mature company in 10 years, growing at the same rate as the economy (2.05% in nominal terms). Its cost of capital will drop to 8%. Since it will have built up some significant competitive advantages at that point, I will assume that it can generate a return on capital of 10% in perpetuity after year 10. Based on these inputs for compounded revenue growth, target margin, reinvestment and cost of capital, the value that I obtain for the operating assets of the firm is $9.73 billion. Look at the valuation page on the Groupon spreadsheet for the numbers. It is worth noting that the present value of the expected cash flows over the next 10 years is -$5.4 billion. That reflects the expectation that the firm will need to raise fresh equity (and thus dilute your share of value) to fund it's cash flow needs over the next decade. Debt: Groupon has no conventional interest bearing debt but it does have some leases. Since the magnitude of these leases is small (about $91 million, see page 76 of S1), I have ignored it in both my cost of capital computation and in this stage of the valuation. Equity options: Groupon has 18.4 million options outstanding, with an average exercise price of $1.11 and an assumed maturity of 5 years. Using the company-provided estimate of volatility of 44% and the expected IPO price of $16 as the stock price, the option value was estimated to be $275.53 million. That is based on the presumption that all shares are equal (in voting rights). Since the shares that will be offered to the public are the lesser voting right shares, the value would have to be adjusted down to reflect that. My estimate would be that the class A shares are worth about $14/share and that the class B shares are worth about $15.50/share. The market for social media companies is growing up and attaching more reasonable values for these companies. The antics of Groupon management have hurt it in the market’s eyes; this is the "mismanaged IPO discount" on value. The stock has been deliberately under priced because only 5% of the shares are being offered in the IPO and the company (and its investment bankers) want to see it pop on day one. My guess is that it is a combination of all three factors. Groupon has to be credited with building an interesting business model that has a large potential market and is scaleable. What makes this company interesting is that investing in it is indirectly a bet on the economy. Unlike most young growth companies that are dependent on the economy becoming stronger and more vibrant for higher value, Groupon's value is likely to be higher if the economy stays in the doldrums. After all, what business in a healthy economy wants to sell its products for 70% or 80% of list price? Postscript: A few of you have already noted that I have been optimistic in my assumptions and you are absolutely right: high revenue growth, a healthy target margin, declining cost of capital and no chance of failure. My point is that even with those assumptions, I am falling short of the IPO price. Better still, I would like you to go in and make your own estimates in the Groupon spreadsheet and value the company. To keep tabs on all of our different estimates, I have created a shared Google spreadsheet where you can input estimates and value per share. Should be fun!